Our hot summer days continue and there's not much autumnal about the weather. We could do with some rain. Meanwhile, as the sun shines, we make the most of it. Last Sunday we went to the grounds of Royal Roads University, formerly known as Hatley Castle. I showed you the gardens, but the real reason for the visit was to see the Royal Canadian Mounted Police (RCMP) Musical Ride. Marching bands and seated bands entertained the large crowd until it was time for the stars of the show, the horses and their riders. Our Lieutenant Governor General opened the event. Her arrival to the stands was preceded by the single piper seen above. Bagpipes sound so wonderful in the open air, less so in buildings, I find. The Massed Pipes and Drums featured members from three groups, each in their distinct uniforms. I enjoy drums very much and these musicians did a superb job, marching about the field on a very hot day. Tim pointed out the daggers tucked into the stockings of the one regiment. I did a little research and the dagger is called a sgian-dubh and is a traditional part of Highland dress. Wilfred Owen, the first World War poet, referred to "daggers in plaid socks" in his poem "Disabled." We sat next to the bandstand and I snapped this photo of the crowd as a reflection in the horn. Then came 32 horses and their riders dressed in red serge. How hot they must have been. The Musical Ride is a tradition in the Mounted Police, stemming from trying to relieve the monotony of drills in the 1870s. The riders did tricks and competed amongst each other, and their first performance was in 1876. Intricate turns, drills, and figures, set to music, show off the riding skills of the police officers and showcase the beautiful horses. The horses seemed to dance through many of the movements, light and graceful. One popular move is the charge, seen above, where the officers point their lances forward and urge the horses to gallop. The Musical Ride serves as an ambassador of goodwill these days, rather than as a police unit. They travel all over the world performing and representing Canada. This year, as its our 150th anniversary, the RCMP Musical Ride completed a cross-country tour. Our seats were at ground level, quite close to the front and with the dust, we looked at each other at the end of the show and saw faces covered in dust! Have you ever seen the RCMP Musical Ride? Linking to Mosaic Monday, back after an August break. Hosted by Maggie of Normandy Life. I have never seen it but can only imagine the wonderful spectacle. I love the sound of the pipes and drums and the highland dress is always a delight. Lovely post. What an amazing event to attend, I love all types of marching bands, when I was a little girl the brass bands of Lancashire were my favourites and when we moved to France I fell in love with the pipe bands of Brittany. I don't envy them the heavy costumes in that heat though. Shame you got so dusty! Now that looks like my kind of enjoyment event for sure. I would so love something like this. Bagpipes stir my spirit. We have an outdoor event at a park a little over an hours drive away every year and they have a group that plays them. The horses are wonderful, just love them. It had to be such a thrill to be in attendance of such a fine display. Looks like you had great seats to this amazing show! Hope you have a great first week at school. Another fabulous adventure. Thank you for taking us along. 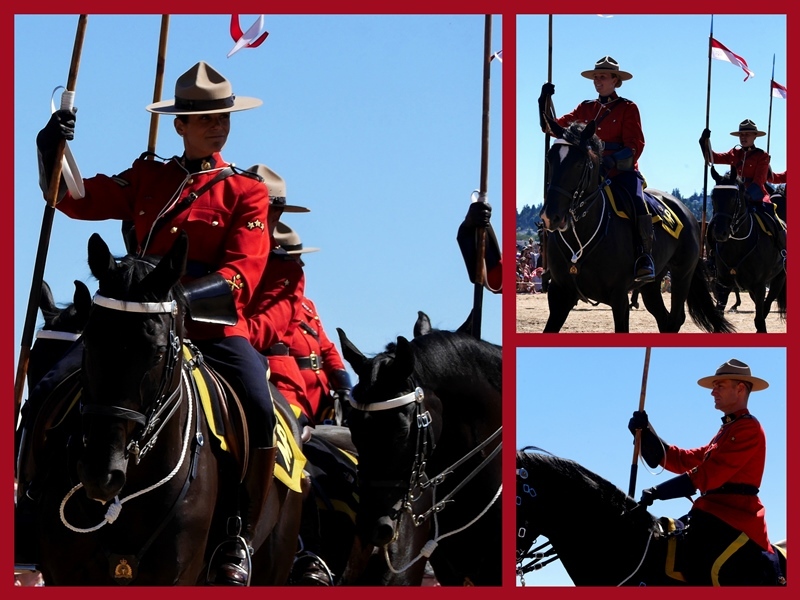 I saw the RCMP musical ride as a kid...and would love to see them again! Thanks for sharing. That looks like a festive time! Amazing sound with all those pipers! I've never seen anything like this but I would love to! And daggers in their socks? Oh my! I would have missed that! Hugs! Hoping for the heat to leave us soon. What a fun event. I did hear about the daggers on some show we watched about Scotland. Hope you are having a nice holiday today. While I have not seen the RCMP musical ride, I have attended the Edinburgh Tattoo in Scotland. An amazing event for anyone that likes pipes and drums! I love the reflection picture - very creative! Lorrie, what a wonderful day! It all looks so grand! That really must have been a grand show. The daggers in the plaid socks are interesting. I would love to see that Lorrie! What a wonderful show. Many years ago on one of our summer trips we saw the RCMP do a small drill in, I think, Bannff NP, but nothing like this one. (I have forgotten the details of that adventure both because it was so long ago and because in those years I was often busy with keeping little ones occupied). All your pictures are great, and the reflection in the horn is fascinating. It all made me feel as if we were there! Oh my goodness. I bet this ride was amazing. Great color! Have a great week! I enjoyed seeing all of your photographs, especially the one of the crowd as a reflection in the horn. Brilliant! The pages on your blog never finish loading for me. Perhaps that is the reason for the loss of so many comments. I just put a "hi" there to hold my place, but am writing this up elsewhere for my sanity's sake. I enjoyed seeing the Mounties and did have an opportunity to see some perform way back in 1968. I have not forgotten; it was that impressive. My cousin's son is a Mountie so provides bragging rights. I have never heard of his performing in this type of drill, though I do know he has a horse. Loved the unique capture of the crowd. That's inspired photography right there. What a fabulous show to see, Lorrie! I smiled when I read that you both looked at each other with dust on your faces! What fun memories you and your hubby make together. No, I've never seen the Mounties...only in movies. Such beautiful and interesting photos. Wishing you sweet September days. No I haven't seen this before. Oh so colorful!!! Those kilts, I love them. Thanks for sharing this beautiful event. That would be so special to see! What an experience! Lorrie, What a wonderfully Canadian thing to see. I have never seen them live in person. Thanks for sharing your photos. Have a great week. Sylvia D.
Lorrie, Love the new blog header. Nice images and layout. Sylvia D.
That looks like an enjoyable show! Nothing like what I've ever seen. l like that shiny horn and how everything about their dress and performance is so propper and perfect. Great photos. Yes, I've enjoyed the RCMP Musical Ride in person. Really spectacular. And Rick and I visted Hatley Castle years ago ... their garden was so beautiful. Autumn is appearing everywhere these days. What awesome photos, Lorrie...especially the reflective one! This looked like a lot of fun. We have been enjoying fall-like weather for the past several days and loving it. Our yard is already full of leaves! Greetings from the UK. Looks a good show. Good luck with your endeavours. What a wonderful show and photos. To me it seems, weather wise, as if the world is topsy turvy right now. Your area should not be having the weather that you are having! And for some unknown reason, my area is having a cooldown ( which I, who hate heat and humidity am enjoying ) that is very unusual / 43 degrees on Sept 9 was what I woke up to this morning.